Scroll through the archives to find past events and ideas for developing future Annunciation/Day of the Unborn Child events (to move more quickly use CTRL F to search and type your state name in the box--then click "next" to find the state listings for other years). If you see an event near you not included on the Current Events listing, you might want to call the church an ask about the current year -- it may be that it is still taking place but has become annual and is no longer publicized as in former years. International events are included at the end of the U.S. listings for each year. NOTE: For liturgical and other reasons, events may take place several days before or after March 25. Also note that the list below includes both Day of the Unborn Child events and those that celebrate the Annunciation only, as well as those that combine the two. Not all Annunciation themed events are explicitly pro-life -- note the name of the event and description. The event listing is a free service for those seeking events to attend--inclusion does not imply affiliation or endorsement in either direction and print materials offered via this site may not be available at the events listed below (for a complimentary prayer card, contact the webmaster directly). 4/9/2018, 9:30 am ET, 30 min. special on "The Feast of the Annunciation"~"Fr. Lawrence Lew, O.P. Vocations Promoter of the English Dominicans, delves into the meaning of the Feast of the Annunciation both for our individual interior life as well as the society of our day." 4/9/2018, 8 am ET, 1:30 min. (reairs at 11:30 am, 6:30 pm 4/9/2018 & 12 midnight-4/10/2018) -- Mass of the Annunciation of the Lord with MFVA--"The Franciscan Missionaries of the Eternal Word celebrate the Mass of the Solemn Feast of the Annunciation live from Our Lady of the Angels Chapel in Irondale, AL." Please note that the list below includes both Day of the Unborn Child events and those that celebrate the Annunciation only, as well as those that combine the two. Not all Annunciation themed events are explicitly pro-life -- note the name of the event and description. The event listing is a free service for those seeking events to attend--inclusion does not imply affiliation or endorsement in either direction and print materials offered via this site may not be available from the churches or organizations listed below (for a complimentary prayer card, contact the webmaster directly). Click here for the shrine's events page, or here to go directly to their Annunciation event page. "Feast of The Annunciation -- the patronal Feast Day for the town and university -- is always a big event in Ave Maria." For more details see their Annunciation event listing and the general events at the aveherald.com home page as well as the Ave Maria University website events listing. Also click on the bulletin link for the week of the Annunciation at the Oratory/Quasi-Parish at this link..
For details visit the KofC council website -- click here for news and events in the Jacksonville FL area. For info on the Novena Masses for Life from Annunciation to Christmas click here -- includes graphic ads, flier, schedule, registration form, and suggested prayers of the faithful for each month. Info may also be found at the website for more on the schedule of Novena Masses for the nine months from the Annunciation to Christmas at the diocesan website here for news and updates and check the calendar here for events/masses in March and the following months on or near the 25th. Mon., Apr. 9, 2018: Day of the Unborn Child -- Good Shepard Knights of Columbus invites you to attend the Stations of the Cross for the Unborn on Apr. 9, 6:30 pm in the church, Good Shepherd Catholic Church, 400 N. Saginaw St., Montrose, MI 48457. 'The International Knights of Columbus asks you to pray for the Unborn and their parents. Offer prayers for all families who have a child that died because of miscarriage, abortion, or stillbirth…illness, disability, accident, violence or other causes." For details visit the church website -- click here for more. The first of 9 consecutive monthly pro-life masses begins in late March (it usually begins the last Saturday of the month, with exceptions noted on the Catholic diocesan website linked below). The masses continue each month through November. Masses of the “Rosary Novena for Life” are sponsored by the Diocesan Pro-Life Office. For updates and current info, including a promotional flier, click here. Click here for info including media and a poster graphic or the following link to a YouTube video. Contact St. Mary's Cathedral and/or visit their website here for more info on their Annunciation Day of the Unborn Child mass and/or procession and benediction. Click here for info from fli.org.au or go directly to their events page for the Day of the Unborn Child. Click here to see scheduled events for Apr. 9th throughout Ireland. Sat. Mar. 25, 2017, 10:30 a.m. -- St. George Greek-Melkite Catholic Church -- pro-life Mass for Day of Prayer for the Unborn Child. Knights of Columbus Council 953 invites community to this Byzantine Rite mass at St. George Greek-Melkite Catholic Church, 1620 Bell St., Sacramento, CA 95864. Fish lunch will follow. Find more info at http://sacramento.kofc953.org/day-unborn-child-approaching-fast. Sat. Mar. 25, 2017, After 5:30 p.m. Vigil Mass by the Tabernacle: St. Jude the Apostle Catholic Church, 7171 Glenridge Dr., Sandy Springs, GA 30328. Find more info at https://judeatl.com/rosary-for-the-day-of-the-unborn-child. Mar. 25, 2017 -- St. Maximilian Kolbe Parish launches its first annual Spiritual Adoption program running from the March 25 Annunciation to Christmas Day -- sponsored by the St. Maximilian Kolbe Parish Respect Life Ministry in conjunction with the Knights of Columbus and Columbiettes Council 10899. Parishioners willing to pray for an unborn child will receive a packet with instruction card, Holy Family prayer card, small baby model, and fabric swatch to use as a blanket or made into "swaddling clothes" -- participants can choose a name for the baby and post it on a Spiritual Adoption prayer board. Wed., March 22, 2017 -- MASS FOR THE UNBORN, 6:30 pm Rosary for the Unborn, 7:00 pm Mass, St. Aloysius Gonzaga, 157 Cleveland Drive, Cheektowaga. (716) 833-1715. 3/25/17 -- The first of 9 consecutive monthly pro-life masses begins in late March (for 2017 the first will be Sat. March 25th -- it usually begins the last Saturday of the month, with exceptions noted on the Catholic diocesan website linked below). The masses (8 am at St. Rose of Lima Church in Buffalo) continue each month through November. Sponsored by the Diocesan Pro-Life Office, each mass of the “Rosary Novena for Life” is followed by silent praying of the rosary in (optional) procession to a local abortion clinic. The church is located at 500 Parker Avenue at Parkside in Buffalo. For updates and current info, including a promotional flier, click here. Sat. Mar. 25, 2017 -- Rosary for the Solemnity of the Annunciation (The National Shrine of Our Lady of Walsingham, 520 Richmond Rd., Williamsburg, VA). Join the Legion of Mary to pray the Rosary for the Feast of the Annunciation following 9 a.m. Mass at the Shrine. March 25, 2017: 10:30 a.m. Notre Dame Cathedral -- Bilingual White Mass in support of Catholic Health Care practitioners. "On the Solemnity of the Annunciation of the Lord, Archbishop Prendergast invites everyone to join Catholic health care practitioners at a special Mass honouring their work in health care and praying for their freedom of conscience." Archbishop Prendergast will be joined by Archbishop Lépine of Montreal. Coffee will follow. "All are encouraged to attend this celebration and to pray with and for our Catholic health care practitioners." For info on the 2016 Novena Masses for Life from Annunciation to Christmas click here -- includes graphic ads, flier, schedule, registration form, and suggested prayers of the faithful for each month. Info may also be found at the website for more on the schedule of Novena Masses for the nine months from the Annunciation to Christmas at the diocesan website here for news and updates and check the calendar here for events/masses in March and the following months on or near the 25th. Mon. April 4, 2016 -- 6:00 p.m. Holy Hour and Mass for the Unborn During the Jubilee of Mercy, Solemnity of the Annunciation (Day of the Unborn Child): Holy Hour 6 pm, Mass 7 pm -- St. Isaac Jogues Church, 21100 Madison, St. Clair Shores, MI 48081. Click here for more details at Ave Maria Radio. Also see the events listing at the original source website here and promotional .pdf flier. Wednesday, March 23, 2016 -- MASS FOR THE UNBORN, 6:30 pm Rosary for the Unborn, 7:00 pm Mass, St. Aloysius Gonzaga, 157 Cleveland Drive, Cheektowaga. (716) 833-1715. CELEBRANT & HOMILIST Reverend Martin X. Moleski, SJ. For more info, including a promotional flier, click here. The first of 9 consecutive monthly pro-life masses begins in late March (for 2016 the first will be Sat. March 19th, but it usually begins the last Saturday of the month, with exceptions noted on the Catholic diocesan website linked below). The masses (8 am at St. Rose of Lima Church in Buffalo) continue each month through November. Sponsored by the Diocesan Pro-Life Office, each mass of the “Rosary Novena for Life” is followed by silent praying of the rosary in (optional) procession to a local abortion clinic. The church is located at 500 Parker Avenue at Parkside in Buffalo. For updates and current info, including a promotional flier, click here. Sunday, Apr. 3, 10:30 am-1:30 pm. 10:30 mass at St. Mary's Cathedral, then Angelus at 12:00 before procession, then 1:30 benediction at cathedral. The ultimate special event to celebrate the feast day is a pilgrimage to the Annunciation church/basilica in Nazareth, where an inscription inside states "The Word was made flesh here." Virtual pilgrimages can be made via the live feed from the site of the Annunciation in Nazareth at the grotto -- it creates a lovely visual background for prayer and/or contemplation on Christ's conception -- to be able to see in real time the place where the Word became flesh, and pilgrims coming to visit this hallowed Holy Land site at the Church of the Annunciation. (For group prayer use a device with a large screen). The live feed is viewable 15 hours a day at https://www.cmc-terrasanta.com/en/event/live-from-the-grotto-of-the-annunciation-in-nazareth/369 -- in EST the times are 11 pm through 2 pm the next day (please note the live feed is often on 24/7 but light levels may be too low to see anything but candlelight). If you are interested in traveling to the Holy Land, click here for information on in-person pilgrimages to Nazareth's Annunciation church. Click here to visit the official site of the basilica, and here for the webpage featuring a video on the new pilgrim's tour that combines the basilica with the archaeological site (click the four-arrows box in the lower right YouTube screen for full size image). A mini photo slide show from the archaeological museum can be viewed here. There is also an informative ChristianNewsToday article on how the Annunciation feast is celebrated in Nazareth ("Nazareth During the Feast of the Annunciation" by Nicole Jansezian for travelujah.com) available here -- events include a special Mass, a traditional parade, and guided tours by the Nazareth Cultural and Tourism Association highlight Mary's Well Square, the Greek Orthodox Annunciation Church, Pilgrims' Route, the House of Culture and Art, Alleys of the Old City, and the Basilica of the Annunciation. For a site that includes one pilgrim's insights on the import of the March 25th feast inspired simply from driving by the Annunciation basilica, click here. Mon. Apr. 4, 2016, 7:30 pm: Annunciation to the Blessed Virgin Mary--Sung Mass (Setting "Missa Aeterna Christi Munera" by Palestrina; Motet "Ave Maria" by Parsons), hosted by St. Michael's Church and Choir, St Michael and All Angels’ Church, is located at Dinham Road, Mount Dinham, Exeter, EX4 4EB. Visit the website here for more information. The site also includes this interesting quote on the history of the day in England where it is often called "Lady Day": "Lady Day is the first of the four traditional English quarter days, and was effectively a “New Year’s Day” in England until 1752. A vestige of this remains in the start of the UK Financial Year moving from 25th March in 1752 to 6th April in 1753, after 12 days had been deleted from September 1752 to bring Britain in line with the Gregorian Calendar of most of the rest of Western Europe which had shifted 11 days in October 1582." Click here for the Westminster Abbey website and view their schedule -- Feast of the Annunciation Events for 2016 include the vigil Evensong April 3rd and the masses and worship on the transfer date of April 4th. Mar. 16-24, EWTN's Annunciation Novena for 2015: (EWTN's suggested Annunciation prayer to be said each of the nine days can be found here). Mar. 24, 2015, Prayer Vigil For Life to be held in Rome (and other locations) on the 20th Anniversary of Evangelium Vitae, which St. John Paul (then Pope) released in 1995 symbolically on the March 25th Annunciation as the document (which translates as "Gospel of Life") upholds the sanctity of human life. Some dioceses may have local events for the anniversary either on the 25th or the vigil the evening of the 24th. (Click here for more info -- Priests for Life encourages local commemorations of the anniversary, which can be combined with Annunciation events). Mar. 25, 12 p.m. ET (EWTN), 2015: Broadcast from Nazareth's Basilica of the Annunciation is the Solemn Mass of the Annunciation (the church is built on the site where Christ's conception is believed to have taken place) -- invite a friend or two to watch the two hour special on March 25th at 12 p.m. ET on the EWTN cable network -- if you don't get EWTN visit their home page and scroll down to their media window to Watch OnLine at 12pm ET. Wednesday, March 25 at 5:30 p.m. -- Annunciation for the City -- "a special evening of worship, joy, and thanksgiving" (Hosted by St. Mary’s at 1910 12th Avenue South Birmingham, AL 35205). "Our parish family, along with many other Birmingham episcopal churches, will celebrate the Feast of the Annunciation here at St. Mary’s on March 25." Tuesday, March 24, 2015 (The Eve of the Feast of the Annunciation), 6:30 p.m., Healing Garden at St. Germaine's Catholic Church, 7997 E. Dana Dr, Prescott Valley, AZ 86314. Mary Queen Of The Knights K of C Council 8386 will once again be sponsoring a Pro-Life Rosary / Prayer Service at 6:30 pm on Mar. 24 in the Healing Garden adjacent to St. Germaine Catholic Church. Wednesday, March 25, 7:00 PM Annunciation of the Blessed Virgin Mary -- Sung Mass for the feast of the Annunciation -- St. John the Baptist Latin Mass Community. Location: Main Church, St. Patrick's, 1921 Maple St., North Little Rock, AR 72114. St. John the Baptist Latin Mass Community is located at St. Patrick's Catholic Church at the corner of 19th & Maple St., one block West of Main St.; parking is available on the street or in the parking lot across from the Church building. Click here for their events page. 90 Mountain View Avenue, Santa Rosa, CA 95407. Vesperal Liturgy on Wednesday, March 25, at 5 PM. A festal fish dinner will be served in the Parish Hall following the Liturgy. Click here for more info. Wednesday, March 25, 2015, 7:00 PM Annunciation of the Lord / La Anunciacion del Senor -- Saint Mary of the Angels Catholic Church, 900 South Oak Street, Ukiah, CA 95482 Click here for more info. Wednesday, March 25, 2015, 8:30 AM -- St Basil The Great Church, 1200 Tuolumne Street, Vallejo, CA 94590, (707) 644-5251. The St. Basil Council of the Knights of Columbus take the opportunity once again to stand up against the evils of abortion by celebrating the International Knights of Columbus Day of Prayer for the Unborn Child. The Day of the Unborn Child was instituted as part of the Order's Crusade for Life, symbolizing the Knights' commitment to building a culture that respects and protects every human life, from conception to natural death. A special mass at 8:30 AM, with the School, will include presentation by the students of flowers, the book of the Innocent, and blessing of pregnant moms and blessing in the Garden of the Innocent by the Pastor. Click here for more info. Wednesday, March 25, 2015, at 5:30 pm in Saint Martin’s Chapel at St. John's Cathedral,1350 Washington Street, Denver, CO 80203. The Feast of the Annunciation of the Lord -- music will be provided by a vocal quartet. Click here for more info. Wed., Mar. 25, 7 p.m.--Traditional Mass for the Feast of the Annunciation: St. Mary's Church. 669 West Ave, Norwalk, CT 06850. St. Mary Church in Norwalk, CT will offer a solemn Mass for the feast of the Annunciation on Wednesday, March 25 at 7 pm. Click here for info. or visit St. Mary's website -- to read more about the music click here. Wednesday, March 25, 2015 -- The Annunciation, St. Paul's -- 2430 K Street, NW, Washington, DC 20037 (An Anglo-Catholic Parish in the Episcopal Diocese of Washington). Click here for more info. Wednesday, March 25, 2015 -- Living Rosary 7 p.m. -- Feast of the Annunciation of the Lord -- Annunciation Catholic Church --1020 Montgomery Road, Altamonte Springs, Florida 32714. "Each candle represents a bead on the Rosary and the prayer is recited as the candle is lit." Click here for more info. Wed. March 25, 2015 -- "Feast of The Annunciation -- the patronal Feast Day for the town and university -- is always a big event in Ave Maria. There will be a Eucharistic Procession around the oratory following the noon Mass. Bishop Frank Dewane will consecrate Ave Maria University to Mary at the 5 p.m. Mass. For more details on this event see the Annunciation page at http://www.aveherald.com or for general events the aveherald.com home page. Alternately visit http://amumusicdepartment.org/performance-calendar or click here for other events at the oratory. Feast of the Annunciation -- Reception following. Presented by St. Peter's Episcopal Cathedral. Free to attend -- free-will offerings accepted. The Cathedral Church of Saint Peter is located at 140 Fourth Street N., Saint Petersburg, FL 33701. Click here for more info. Wednesday, March 25, 2015, 5:30 pm - 6:30 pm, Feast of the Annunciation of the Lord, St. James' Episcopal Church, 161 Church St., (corners of Church & Polk Street), Marietta, GA 30060. Click here for more info. Wednesday, March 25th -- Feast of the Annunciation -- 9:45 am Litany, followed by Holy Eucharist at 10:00 -- St. Johns Church, 1 W. Macon Street Savannah, GA 31401. Click here for more info. WEDNESDAY, MARCH 25, 2015, FEAST OF THE ANNUNICATION -- 7 p.m. at 163rd Street, Calumet City, IL 60409, in the Sanctuary. A Rosary for life will be said on this Feast Day, which is also marked as International Day of the Unborn Child. All are invited to attend. The rosary is sponsored by the Knights of Columbus, Lansing council no. 3540 at Our Lady of Knock parish. Click here for more info. Wed., Mar 25 -- THE ANNUNCIATION (Evenings of Faith) - Assumption Catholic Church, 323 West Illinois Street - Chicago IL 60654 -- "On the day the Church celebrates the Feast of the Annunciation, Fr. Robert Warsey, a Chicago pastor who has offered courses in Mariology, will look at the details of the Gospel story of the Annunciation, familiar to us through the recitation of the Hail Mary and numerous works of art. He will show how God’s invitation and Mary’s response is essentially the entire Gospel in miniature. It is a story of vocation and discipleship, not only for Mary but also for us." Click here for more info. "The program begins with Mass in Church at 6:00 pm followed by a simple Lenten Meal served at 6:30 pm in the Parish Hall. The speaker's session is from 7:00 to 8:00 pm. Join us for the entire evening or for any portion of the evening. Reservations are required only for the meal. (A five dollar donation is suggested for the meal) Reserve on-line...or call 312-644-0036 by noon on Tuesday prior to the session. Bring a friend!" Sun., Mar. 22, St. Cecilia Catholic Church, 155 North Main St. Glen Carbon, IL: Day of the Unborn Rosary, Prayer Card Distribution (all masses -- 8:30am & 11:00 am. ), For more visit the Facebook page here and the website. Contact the Family Resources Center for info on annual Annunciation events: The center is located at 415 N.E. Monroe St., Peoria, IL 61603. Phone: 309-637-1713. Click here for more on the FRC, or for the Peoria diocese Respect Life website click here. March 25th -- 7 p.m. -- St. Mary Navilleton Church -- "We will be celebrating the Feast of Annunciation March 25th starting with Mass at 7 pm and a dessert reception in the Parish Hall following Mass." St. Mary Navilleton Church, 7500 Navilleton Rd., Floyds Kobs, IN 47119. Click here for more info. Wed. March 25, Feast of the Annunciation. 5:30 p.m. Potluck Supper followed by film "Mary of Nazareth" at 6:00 pm. (Msgr. John Kuzmich Life Center at St. Vincent de Paul, 1502 E. Wallen Rd., Ft. Wayne, IN). Click here for more info. Wednesday, March 25, ROSARY AND MASS FOR THE UNBORN (6:30 PM Rosary / 7:00 PM Mass / Refreshments afterward) St. Francis Xavier Basilica, Dyersville located at 104 3rd St. SW, Dyersville, IA 52040: "In honor of the Solemnity of the Annunciation and the Day of the Unborn Child, the Knights of Columbus and Dubuque County Right to Life, Inc. are sponsoring a Mass for the Day of the Unborn. Mass will be on Wednesday, March 25 (exactly nine months before Christmas) at the Basilica of St. Francis Xavier in Dyersville. The evening will open at 6:30 PM with a special pro-life rosary, followed by Mass at 7:00 PM…All area priests are invited to concelebrate. Music will be provided by a Children’s Choir…Following Mass, refreshments will be served by the Dyersville Knights of Columbus, Council 1734. Everyone is welcome! Please come." Click here for more info. or here to visit the Basilica website. Wednesday, 25 March, Time: 21:00 -- Annunciation Ice Cream Social -- Location: Didde Catholic Campus Center, 1415 Merchant St., Berkeley Hills, KS. "To celebrate a Marian Feast day we will be serving tons of delicious ice cream. Come celebrate a great day with ice cream and fellowship!" Click here for more. Tuesday, March 24th -- Eve of the Feast of the Annunciation at Mother Seton Parish -- 6:30 PM Rosary For Life, & 7:00 PM Holy Mass, followed by guest speaker Fr. David Wells, of St. John Neumann Parish. This Annunciation Vigil Mass will be at MOTHER SETON CATHOLIC CHURCH, 19951 Father Hurley Boulevard, Germantown, MD 20874. Click here for more info, or here for the flier. Wednesday, March 25 at 7:00 PM -- Day of the Unborn Child Prayer Service on The Annunciation of Our Lord -- St. Alphonsus Rodriguez Church, 10800 Old Court Rd, Woodstock, MD 21163. "Join the Knights of Columbus in the church at 7:00 PM on Wednesday, March 25, as we observe the Day of the Unborn Child on the Annunciation of Our Lord with a brief prayer service and Rosary. Initiated by Saint John Paul II, the Day of the Unborn Child coincides with the Feast of the Annunciation as a day of celebration and remembrance for all unborn human beings. It is a time to celebrate human dignity and the amazing world of the developing child yet to be born. It is also a day to remember the millions of unborn children whose lives have been ended by the violence of abortion. Please join us in prayer." celebrate both the Annunciation of the Theotokos and Greek Independence Day! Please share this event with your friends!" Advance ticket sales only -- no tickets at the door. For further details and flyer click here. March 25 -- THE ANNUNCIATION Divine Liturgy 9:30 am -- Sts. Constantine and Helen Greek Orthodox Church, 37 Lake Parkway, PO Box 713 Webster, MA 01570. Click here for more info. Lord -- Cathedral of St. Paul 19 Chatham St., Worcester, MA. "Join Bishop McManus and students from our Catholic schools for the annual Mass for Life on the Solemnity of the Annunciation of the Lord, Wed., March 25, 2015 at 10:00 a.m. at St. Paul's Cathedral, 19 Chatham St., Worcester. The Diocese of Worcester's annual Pro-Life Awards will also be presented at this Mass. All are welcome!" Click here for more info. Wed., March 25, 2015, 6:00 PM - 8:00 PM. Day of the Unborn. Holy Hour followed by Mass - 6:00 pm Exposition, Rosary, Chaplet of Divine Mercy. Mass at 7:00 p.m., St. Isaac Jogues Church, 21100 Madison, St. Clair Shores, MI 48081. For more info click here and visit the events page here. Wednesday, March 25, 2015 -- 6:30 PM -- Feast of The Annunciation Mass at 6:30 pm -- St. Rose of Lima Church, 180 S. Fremont St, Lewiston MN 55952. For more info click here. Mar. 24 & 25 (both with choir). March 24 Annunciation Festal Matins at 6:15 p.m., and March 25 Annunciation Vesperal Liturgy at 9:00 a.m. St. Mary's Orthodox Cathedral, 1701 Fifth St. NE, Minneapolis, MN 55413. 39157. For more visit the Facebook page here and the website here. For more info click here to visit the Cathedral of St. Mary of the Annunciation site. Saturday, Mar. 21 -- "The Day of the Unborn Child Observance at St. Patrick's is scheduled for Saturday, March 21. It begins with Stations of the Cross for Life at 7:30 a.m., followed by Mass at 8 a.m. These stations were composed by then Pope John Paul II and have a pro-life theme. Some stations differ in subject from the usual stations, but are consistent with events that led to Christ's crucifixion. This is a parish event sponsored by the St. Patrick's Knights." St Patrick's Church is located at 6111 Morrill Ave Lincoln, Nebraska 68507. For details click here and to visit the church website click here. April 12, 2015 --Date changed due to snow accumulation -- outdoor event at (Holy Rosary ???) Cemetery. "The Annual Knights of Columbus International Day of the Unborn Child (normally celebrated near the Feast of the Annunciation March 25th) has been moved to be held as part of the two Masses on Sunday, April 12, 2015 (usually 11:30 AM, 8:30 AM on Sun.) due to the remaining snow in the cemetery. Our KofC Bishop Bradley 4th Degree Assembly #626 will be providing a color guard for the day. After each mass there will be a prayer led by our Priest in the parish cemetery at the Knights of Columbus headstone memorial for the unborn child. For more info click here. To contact the K of C council for directions to the cemetery memorial for the unborn click here. Saturday, March 28th at 8:30 AM -- Healing Mass In Honor of The Feast of the Annunciation, Sacred Heart Church, 751 Main Ave., Bay Head -- "I f you are suffering from an illness or experiencing the stress of life and its burdens, please join us on Saturday, March 28th at 8:30am for a Mass with Healing Prayer. We will seek the intercession of Our Blessed Mother for Jesus Healing as we come together and pray for one another. Light refreshments will immediately follow mass in the parish hall. Please come and bring a friend or family member." For more info click here. [Note: Events may take place the weekend before March 25th -- See entry for North Arlington]. For details visit the Corpus Christi Parish Facebook page here. Wednesday, 25 March -- The Feast of the Annunciation of the Blessed Virgin Mary -- Grace Church -- Time: 19:00 -- at Grace Church -- 950 Broad St., Newark, NJ. The Feast of the Annunciation of the Blessed Virgin Mary -- You are invited to experience an Anglo Catholic High Mass hosted by the The Society of Catholic Priests - The Diocese of Newark Chapter. There will be a light meal with discussion following the celebration of the Mass. For more info click here. Sunday, March 22, 12 noon. International Day of the Unborn Child. At 12:00 noon there will be a Mass, Followed by Procession from Church with 54 Vigil Candles representing the estimated 54 million babies aborted since Roe vs. Wade. The Blessed Sacrament will be carried and the Rosary recited during the procession. If you wish to participate, or would like more information, Queen Of Peace, 10 Franklin Place, North Arlington, NJ 07031. For more info click here. March 24, 2015, 7:30 pm. Knights of Columbus Mass for the Day of the Unborn Child in the OLM chapel at 7:30, Fourth Degree meeting to follow. Our Lady of Mercy Church, 46 Pascack Road, Park Ridge, NJ 07656. For more info click here and visit here. March 25, 2015, 6:30 p.m. St. Paul's Choir, Evensong-Feast Of The Annunciation followed by Potluck Lenten Supper. St. Paul's Episcopal Church, 414 East Broad St., Westfield, NJ. Immediately Following The Choral Evensong, The Public Is Invited To Join Parishioners For A Potluck Lenten Supper In The Parish Hall. For more info click here and visit St. Paul's Episcopal Church website here. Eucharistic Adoration, 11:00 am - 6:30 pm, A Mass will be celebrated at 6:30 pm (716-836-0011). For more info, including a promotional flier, click here. Wednesday, March 25, 2015 -- MASS FOR THE UNBORN, 6:30 pm Rosary for the Unborn, 7:00 pm Mass, St. Aloysius Gonzaga, 157 Cleveland Drive, Cheektowaga. (716) 833-1715. CELEBRANT & HOMILIST Reverend Martin X. Moleski, SJ. For more info, including a promotional flier, click here. The first of 9 consecutive monthly pro-life masses begins in late March (usually the last Saturday of the month, exceptions are noted on the Catholic diocesan website linked below). The masses (8 am at St. Rose of Lima Church in Buffalo) continue each month through November. Sponsored by the Diocesan Pro-Life Office, each mass of the “Rosary Novena for Life” is followed by silent praying of the rosary in (optional) procession to a local abortion clinic. The church is located at 500 Parker Avenue at Parkside in Buffalo. [For 2015 it begins on Saturday, March 28. The remaining Saturdays are: April 25, May 30, June 27, July 25, August 29, September 26, October 31 and November 21* (with exceptions as noted by *)] For updates and current info, including a promotional flier, click here. Wednesday, March 25th -- 7 p.m. -- Church of St. Joseph, 130 5th St., Garden City, NY 11530. -- The Knights of Columbus "Day of the Unborn Child" and Spiritual Adoption Novena -- "The Church of St. Joseph Respect Life Ministry and Knights of Columbus invite you to gather in prayer at a special 7 PM Mass, Wednesday, March 25th celebrating The Feast of the Annunciation which is the beginning of our annual Spiritual Adoption Prayer Novena and the annual Knights of Columbus "Day of the Unborn Child". ALL parishioners are invited to attend Mass and begin their Spiritual Adoption Novena that evening. We especially invite all Knights of Columbus brothers to attend this Mass together, and then convene in the St. Agnes Room for thier monthly meeting." For more info and a file link to a .jpg flier click here, and visit the parish website here. Visit http://goarch.org/news for a link to the Archbishop's schedule and events. Columbus will celebrate by having a prayer service at 7:30 p.m. at St. Jerome’s. The prayer service will involve: rosary, exposition, scripture reading, and benediction. Please join us. All are welcome." Church of St. Jerome, 207 Garfield Street, East Rochester, NY 14445. For more info click here, and visit the parish website here. Wed. Mar. 25, 6:30 p.m. Feast of the Annunciation Mass at Our Lady of the Annunciation in Albemarle, NC, 416 North 2nd St.
Wed. Mar. 25, 7:00 p.m. St. Thomas Aquinas Church, 1400 Suther Road, Charlotte NC 28213. Feast of the Annunciation High Mass in the Extraordinary Form. For more visit the St. Thomas Aquinas Catholic Church website here. Wed. Mar. 25 -- PRAYER FOR THE UNBORN CHILD -- St. Elizabeth Ann Seton Catholic Church -- "The Knights of Columbus and the Columbiettes invite all parishioners to pray the Rosary after the 5:30 Mass on Wednesday, March 25th (the Feast of the Annunciation), in the St. Francis de Sales Chapel. The purpose is to commemorate the day of the Unborn Child, which has been designated to be observed in conjunction with the Feast of Annunciation." St. Elizabeth Ann Seton Catholic Church, 1000 Andrews Rd., Fayetteville, NC 28311. For more click here. Wed. Mar. 25, 6:00 p.m. Sacred Heart Church in Salisbury, NC, 375 Lumen Christi Lane, Salisbury, North Carolina 28147. Feast of the Annunciation High Mass in the Extraordinary Form. For more click here. March 24th, 25th & 29th Events at The Annunciation Greek Orthodox Cathedral -- 555 North High Street, Columbus, Ohio 43215. For more click here. Tuesday March 24, 2015: Feast of the Annunciation to the Most Holy Theotokos - Great Vespers, 5:30 p.m. Dessert and Coffee Reception (after Great Vespers) -- Hosted by the "50 Plus Group" -- "Please bring a Lenten dessert to share." Wednesday March 25, 2015: Feast of the Annunciation to the Most Holy Theotokos - Orthros, 8:15 a.m.; Hierarchical Divine Liturgy, 9:30 a.m.; Artoklasia, 11:30 a.m. Parish Feast Day Luncheon (after the Hierarchical Divine Liturgy). March 29, 2015: -- "FEAST OF THE ANNUNCIATION AND GREEK INDEPENDENCE DAY PROCESSION: In celebration of the Feast of the Annunciation to the Most Holy Theotokos and Greek Independence Day, we will have a procession with the icons of the Mother of God, Greek flags, and American flags at the end of Divine Liturgy on Sunday, March 29, 2015. All Sunday Church School and Greek Language School students are requested to wear traditional Greek outfits and participate!" Wednesday, March 25th, Day of the Unborn Observance at 7 p.m. at St. Joseph Catholic Church, 670 W Main St., Plain City, Ohio. "The officers of our St. Joseph Knights of Columbus Council 12772 will pray the Rosary in front of the statue of the Blessed Mother to highlight the Day of the Unborn Child on Wednesday evening, March 25, at 7 p.m. at the church." For more click here. Divine Liturgy on Wednesday, Mar 25, at 6:30pm, followed by a festal supper. For more click here. For info see www.steleanor.com and www.cenaclesoflife.org. Wed. March 25 -- Sung Annunciation Evensong & Mass with Guest Preacher – St. Stephen's Church, "an Anglo-Catholic parish in the Episcopal Diocese of Rhode Island" -- 114 George Street, Providence, RI -- "This Wednesday evening, we will offer Sung Evensong and Mass for the Feast of the Annunciation at 5:30 and 6 pm respectively in the Lady Chapel." For more info click here. For info visit the ProLife Amarillo Website. Special events often include an annual Respect Life Banquet held on or near the Feast of the Annunciation. Wednesday, March 25, 2015. St. Joseph Catholic Church, 609 E. Gramman St., Beeville TX 78102, (361) 358-3239. Rosary for the Unborn at 5:30pm, Holy Mass at 6:00pm for The Protection of Every Human Life from Conception to Natural Death, followed by a social in the foyer. Knights of Columbus Council 1653 invites you to take part in celebrating the International Knights of Columbus Day of Prayer for the Unborn Child. For more info click here. March 25 2015. The Feast of the Annunciation 7:00 pm -- Trinity Lutheran Church of Clara, TX located at 11867 FM 1813 Iowa Park, TX 76367. For more info click here. Sunday, 22 March, 11:00 a.m. -- Annunciation Catholic Church, 1618 Texas St., Houston, Texas -- Annunciation Closing Mass of the 145th Year. "Celebrate Mass with Cardinal Dinardo at Annunciation, the oldest extant Catholic Church in Houston, in honor of the end of our 145th year. Bring your friends and family for this momentous occasion! A brief reception will follow Mass, with light food in the courtyard." For more info visit here. Sun. Mar. 22, 9:15 am - 9:45 am. St. Anne Catholic Church, 1111 S. Cherry St, Tomball, TX 77375. Sunday, March 22 Rosary prayer service after the 8:00 AM Mass. The prayer service will take place at the “Monument to Life” on the west side of the church from 9:15 – 9:45 AM. All are welcome. Wednesday, March 25, at 8:00 pm. -- Mass for Feast of Annunciation. A Missa Cantata will be offered at St. Elizabeth Ann Seton Church in Woodbridge, Virginia, on Wednesday, March 25, at 8:00 pm. Music will be provided by the church’s St. Ambrose Schola. Confessions will be heard beginning at 7:00 pm. St. Elizabeth Ann Seton Church is located at 12805 Valleywood Drive in Lake Ridge. Ample free parking is available. For more info click here. Wednesday, Mar. 25 -- 6:45 a.m. & 7:00 p.m. -- St. John Chrysostom Byzantine Catholic Church, 1305 S. Lander St., Seattle, WA 98144 -- The Feast of the Annunciation of the Theotokos Solemn Holyday -- Matins at 6:45 am, and Vespers with Divine Liturgy at 7:00 pm (Mitigation of the fast). For more info click here -- and to visit the church website click here. Wednesday, March 25th - Annunciation Feast Day -- 8:00 am Mass with social and refreshments to follow at ANNUNCIATION OF THE BVM Church, 401 Gray Street, Green Bay, WI 54303. For more info click here. Tuesday, March 24 -- 6 p.m. Eve of the Feast of the Annunciation -- Grace Episcopal Church, 1011 N 7th St., Sheboygan, WI. 53081. "We celebrate on 24 March at 6:00 p.m. the Eve of the Feast of the Annunciation, which commemorates the annunciation by the archangel Gabriel to Mary that she will bear the Messiah (Luke 1.26-38) On this day the liturgical colors change in Lent, i.e., the feast takes precedence over the season. It was, in the West, New Year's Day until 1582. Please come and join the festivities." For more info click here. Wednesday March 25 -- 6 p.m. -- Holy Family - Anglican Rite Parish, 4100 SE Wyoming Blvd. Mass will begin at 6 p.m. followed by a simple soup supper and Lenten study. "All interested people are invited to attend." For more info click here. Note: Spanish speaking countries often have multiple large-scale nationwide pro-life events centered on the March 25th feast -- as the day approaches visit http://sialavida25m.org and http://veladas25.org for more information. (The Google search engine site's language tools link can be used to produce an English translation of websites in other languages). March 21, 2015 (1:00 pm - 5:00 pm). Blacktown NSW 2148, Australia. Click here and also here for details. Mar. 28, 2015, Day of the Unborn Child Annual Mass, 11 a.m., St. Mary's Cathedral. Archbishop Tim Costelloe SDB will be the main celebrant at 2015’s annual Mass to remember the Day of the Unborn Child. This takes place at 11 am on Saturday, 28 March in St Mary’s Cathedral and is offered for all babies conceived but not born due to miscarriage or abortion. It is an opportunity for families and the community to offer prayers, and hopefully to find healing, for these pregnancy losses. This year, the Mass coincides with the end of the 40 Days for Life Campaign which runs from 18 February to 29 March. Click here for info. Sunday, March 22 2015: 10:30 a.m. Mass at St. Mary's Cathedral; 12 noon Angelus followed by prayerful procession through streets of Sydney; 1:30 p.m. Click here for info including media and a poster graphic or the following link to a YouTube video. March 25, 2015 -- Solemnity of the Annunciation of the Lord -- Holy Mass in the Crypt Church: 7 AM, 8:30 AM, 10 AM, 11:30 AM, 12:15 PM (in English), 2 PM, 4:30 PM and 7:30 PM -- St. Joseph's Oratory at Mount Royal, 3800 Queen Mary Road, Montréal (Québec) H3V 1H6. Click here for info. The March 25 pro-life/Incarnation mass takes place at the Cathedral of Quito, and several cities in the Episcopal Conference--a Mass for the unborn child and Thanksgiving for the Incarnation of Christ in the womb of Mary. (El 25 de marzo se realiza en la Catedral de Quito y de varias ciudades de la Conferencia Episcopal una Eucaristía por los niños no nacidos y en Acción de Gracias por la Encarnación de Cristo en el Vientre de Marìa Santísima). 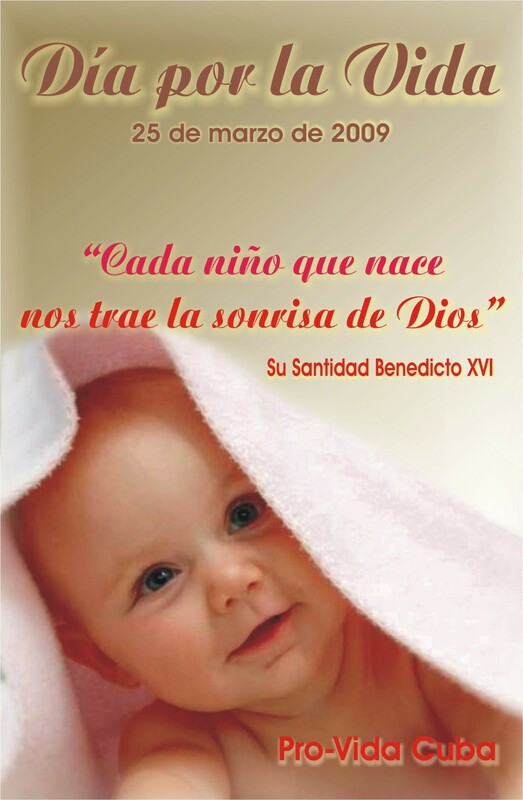 (9 Month Event Series)--Every 25th of the month in 5 parishes of the Archdiocese of Quito there is a Mass for the unborn child and the blessing of pregnant mothers. For the most current info visit http://blog.sanandresarrixaca.es/ that includes an an entry on the day's significance as well as links to the materials below -- and also check the websites at http://sialavida25m.org/ and http://veladas25.org/ for more information. Wed., March 25, 7:30 pm. Annunciation to the Blessed Virgin Mary--Sung Mass, hosted by St. Michael's Church and Choir, St Michael and All Angels’ Church, is located at Dinham Road, Mount Dinham, Exeter, EX4 4EB. Visit the website here for more information. It notes that in keeping with the feast day, the "Music will be more festive than in the rest of Lent, and include, as Communion Motet, “A Hymn to the Virgin” by Benjamin Britten, a macaronic carol with alternating English and Latin medieval text, written when he was only 16 years old. The Mass Setting is Missa Dixit Maria by Hans Leo Haßler." The site also includes this interesting quote on the history of the day in England where it is often called "Lady Day": "Lady Day is the first of the four traditional English quarter days, and was effectively a “New Year’s Day” in England until 1752. A vestige of this remains in the start of the UK Financial Year moving from 25th March in 1752 to 6th April in 1753, after 12 days had been deleted from September 1752 to bring Britain in line with the Gregorian Calendar of most of the rest of Western Europe which had shifted 11 days in October 1582." Click here for the Westminster Abbey schedule of Feast of the Annunciation Events. March 25 (Tue. ), 12 pm-6 pm: Our Lady of Mount Carmel Church, 2819 Whitney Ave., Hamden CT 06518. Adoration of the Blessed Sacrament from noon to 5 pm in observance of the Annunciation of the Lord and the Day of the Unborn. Respect Life rosary and benediction will follow at 5 pm. For info click here. Also click here for other events at the oratory or for a general calendar of events see www.aveherald.com. March 25 -- Nativity Catholic Church, 8 pm. Feast of the Annunciation and the Day of the Unborn Child -- Come pray a rosary for the unborn! Tuesday, March 25 at 8:00 p.m. Meet at the Monument for the Unborn! (between the Social Hall and the main Church). 705 E. Brandon Boulevard, Brandon, FL 33511, 813-215-8115. March 25, 2014, 6:30 pm, Rosary for the Unborn, Holy Angels Parish, 120 S. Lancaster Ave., Aurora IL. The rosary will begin after the 6:30 Lenten talk. March 26 (WEDNESDAY), 6 pm. Sacred Heart Catholic Parish (405 S. Henrietta St., Effingham, IL) announces that the Effingham Knights of Columbus will host a Rosary for Life on Wednesday, March 26, 6:00 pm at the K of C Pavilion. In case of inclement weather, it will be held inside. March 25, 2014 (TUESDAY,) 7 p.m., Feast of the Annunciation~ Rosary for Life at 3010 Ridge Road, Lansing, IL (in the Sanctuary): "A Rosary for life will be said on this Feast Day which is also marked as International Day of the Unborn Child. The rosary is sponsored by the Knights of Columbus, Lansing council no. 3540, at St. Ann’s parish. The feast of the Annunciation of the Lord celebrates the angel Gabriel's appearance to the Virgin Mary (Luke 1:26-38), his announcement that the Blessed Virgin had been chosen to be the Mother of Our Lord, and Mary's fiat—her willing acceptance of God's holy plan. This date also challenges us to focus on the central aspect that can be most easily overlooked--the Incarnation at Christ's conception--the moment the Word was made Flesh--God becoming man. The Day of the International Unborn Child was initiated by Pope John Paul II to coincide with and to honor the Feast of the Annunciation, the March 25 event has grown into a day of celebration and remembrance for all unborn human beings. The Knights of Columbus have a Special Relationship with our Blessed Mother and the Rosary. Her response is an example to all women, who are with child, 'Thy will be done'. All are invited at to attend a Rosary for Life at 3010 Ridge Road, in the Sanctuary starting at 7:00 PM." March 25 (Tue. ), 6 pm., St. Joseph's Catholic Church, 302 Fifth St. S.E., MASON CITY, IA. "The Knights of Columbus and Epiphany Parish invites the public to celebrate the 13th Annual International Day of the Unborn at a 6 p.m. Mass on Tuesday, March 25. The Mass for the Feast of the Annunciation will take place at St. Joseph's Catholic Church, 302 Fifth St. S.E. The Knights’ 4th Degree Honor Guard will be present. Those who attend are asked to bring donations of diapers, baby wipes, diaper ointment and baby shampoo/wash to the Mass for the Epiphany Parish Baby Pantry, which provides necessities to families in their time of need. The Day of the Unborn was instituted by the Knights of Columbus as a symbol of commitment to building a culture that respects and protects every life from conception to natural death." The first of 9 consecutive monthly pro-life masses begins in late March (usually the last Saturday of the month, exceptions are noted on the Catholic diocesan website linked below). The masses (8 am at St. Rose of Lima Church in Buffalo) continue each month through November. Sponsored by the Diocesan Pro-Life Office, each mass of the “Rosary Novena for Life” is followed by silent praying of the rosary in procession to a local abortion clinic. The church is located at 500 Parker Avenue at Parkside in Buffalo. For updates, cancellations and exceptions to the above as well as other events in the Buffalo diocese, click here for more info. March 25th (Tue.) 6 p.m., St. Agnes Catholic Church, 204 Saint Clair Ave., Mingo Junction, OH 43938: The Knights of Columbus Council 4361 is sponsoring this Day of the Unborn Child Feast of the Annunciation Mass in Mingo. March 25, 2014 -- 6:00 pm to 7:00 pm at St. Eleanor parish, 647 Locust St., Collegeville, Pa 19426 in Our Lady's Eucharistic Adoration Chapel. Please mark your calendars to celebrate the Feast of the Annunciation on Tuesday, March 25, 2014, International Day of the Unborn Child, to pray for every unborn child's protection while attending the Cenacles of Life. We begin with the Angelus, Cenacles of Life and end with the Divine Mercy Chaplet, for all life, from conception to natural death. The Cenacles of Life is held every Tuesday in Our Lady Adoration Chapel from 6:00 PM to 7:00 PM. For more see www.steleanor.com and www.cenaclesoflife.org. March 25th -- 7:00 p.m. at Blessed Teresa of Calcutta, 256 Swamp Pike, Schwenksville, PA 19473. (The church also serves Boyertown, Spring-Ford, Pottsgrove and Pottstown.) For more info visit the website http://www.somerscom.net/koc15456/?page_id=1544 that includes this nicely-worded summary of the event and the day's significance: "The Knights of Columbus Council #15456 encourages everyone to join us on March 25th at 7:00 p.m. at Blessed Teresa of Calcutta, to pray for the unborn child, observing the Day of The Unborn Child. The International Day of the Unborn Child is observed on March 25. It is a day to recall the remarkable journey of life each member of the human family has taken, or been prevented from taking by the act of abortion. It was established by Pope John Paul II to coincide with the Feast of the Annunciation. John Paul II viewed the day as ‘a positive option in favor of life and the spread of a culture for life to guarantee respect for human dignity in every situation’. Countries all around the world are holding special observances, rallies, marches and events on the International Day of the Unborn Child to again call for legal protection of the most fundamental human right of all — life." Tuesday, March 25th, from 2 to 4 p.m. Join the annual gathering on the Feast of the Annunciation. Prayers will be offered for the many lives lost through in vitro fertilization (IVF) and other assisted reproductive technologies (ARTs). We will gather at the West Virginia Center for Reproductive Medicine at 1322 Pineview Drive in Morgantown, WV. March 25th, 2014: The Helpers of God's Precious Infants is organizing a Day of Vigil for the Unborn on Tuesday, March 25th, 2014 (Feast of the Annunciation) -- an opportunity to perform a work of mercy during Lent. Similar to the 40 Days for Life campaign, participants will be asked to stand across the street from 65 Bank St. (just in front of the 240 Sparks St. Mall). Sidewalk counselors will be present for most of the day. For more info click here. The Knights of Columbus and Dubuque County Right to Life, Inc. are sponsoring a Mass for the Day of the Unborn at St. Anthony's Church, 1870 St Ambrose St. The evening will open at 6:25 pm with the Rachel Rosary, followed by Mass at 7:00 pm. The Knights of Columbus will provide refreshments in O'Malley Hall following Mass. Everyone is invited. Monday, April 8th, 2013 at 7:00 P.M.
April 8th, 2013 at 7:00 P.M.
March 23 (Sat. ): The first of 9 consecutive monthly pro-life masses begins in late March (usually the last Saturday of the month, exceptions are noted on diocesan website). The masses (8 am at St. Rose of Lima Church in Buffalo) continue each month through November. Sponsored by the Diocesan Pro-Life Office, each mass of the “Rosary Novena for Life” is followed by silent praying of the rosary in procession to a local abortion clinic. The church is located at 500 Parker Avenue at Parkside in Buffalo. 128 West 37th Street, between Broadway and Seventh Avenue). MONDAY APRIL 8 -- St. Mary Magdalene Anglican Church. THE FEAST OF THE ANNUNCIATION (transferred) & SPECIAL CELEBRATION MARKING THE 125TH ANNIVERSARY OF THE FIRST SERVICE HELD AT SMM ON 8 APRIL 1888. Located at the corner of Manning Avenue and Ulster Street: four blocks west of Bathurst, one block north of College and one block south of Harbord. Note: For 2012 the Catholic observance of the Annunciation is transferred to March 26th to avoid a Lenten Sunday conflict -- special events may also be moved to this day. In 2012 March 25th falls during the crucial opening weekend of the pro-life movie October Baby (attending a film with life-affirming themes would be a positive way to honor the day -- click here for theatre locations or here for more info on October Baby). Also in 2012 the Pro-Life Action League has joined with Citizens for a Pro-Life Society to hold the Nationwide Rally for Religious Freedom on March 23rd -- organizers specifically chose March 23 because it is the Friday closest to the Annunciation feast. There are many rally sites throughout the U.S. for those seeking to mark the day with public activism -- click here for rally locations or here for an article on the rally and the significance of the date's selection. NOTE: For liturgical and other reasons, events may take place several days before or after March 25. Since the feast is movable, the changes are often made to avoid Easter week conflicts. If the date is other than the 25th, it will be noted in the listings. Since information comes from a variety of sources, you may want to call the church/venue to confirm. Please note that the event listing is a free service--inclusion does not imply affiliation or endorsement and print materials offered via this site may not be available at the events listed below (for a complimentary prayer card, contact the webmaster directly). March 26, The International Day of the Unborn will be observed with a march at Legislative Hall in Dover, from 2 to 4 pm. Sponsored by Helpers of God's Precious Infants, this annual event is a public witness to the sanctity of human life. At 5 pm, Brother Vincent Council of the Knights of Columbus will serve a free dinner in Mother Drexel Hall, at St. Polycarp Parish in Smyrna, De. A pro-life Rosary at 6:30 pm will be followed by a 7 pm Eucharist. The Most Rev. W. Francis Malooly, Bishop of Wilmington, will be the celebrant. St. Polycarp is located on South Street, 1/2 mile from U.S. #13. For information, call the parish office at 653-8279. For the Solemnity of the Annunciation, the AMU Men's Schola Gregoriana will chant the Ordinary and Proper chants at this Missa Cantata in the Extraordinary Form. March 24, 2012 -- Annunciation Pro-Life Mass (5 pm) & Banquet (6:30 pm) at Sts. Peter and Paul Catholic Church, 36 N. Ellsworth, Naperville, Illinois 60540. Knights of Columbus Fundraiser Banquet benefits both The Waterleaf Women’s Center located in Aurora, IL and The Father Michael J. McGivney Women’s Center located in Glenview, IL. The main celebrant and speaker for the evening will be the Bishop of Joliet, Daniel Conlon. St. Rosalia-Regina Pacis Catholic Church -- Annually on the Feast of the Annunciation, the statue from the "Mary Mother of the Unborn" chapel is brought up to the church for a blessing of pregnant women, newborns, and all those mourning the loss of a child -- contact the church for more information. Click here to read more about the Chapel of Mary Mother of the Unborn. Mar. 21 (Wed.) Annunciation Mass for The Day of the Unborn Child. 7 p.m. Contact St. Aloysius Gonzaga church in Cheektowaga 716-833-1715 located at 157 Cleveland Dr. (at Century Rd.). Click here for more info. Sponsored by the Bishop Benincasa Council of the Knights of Columbus. Mar. 25 (Sun.) 7 p.m-9 p.m. St. Amelia's. Holy Night of Prayer for the unborn, expectant parents, and couples hoping to conceive. Mass will be celebrated at 7:00 pm, followed by an hour of Eucharistic adoration and reflective prayer. The night will conclude with Benediction at 9 p.m. St. Amelia Parish, 2999 Eggert Road, Tonawanda, 716-836-0011. All are welcome! Mar. 31 (Sat.) The first of 9 consecutive monthly pro-life masses begins on the last Saturday of March. The masses (8 am at St. Rose of Lima Church in Buffalo) continue each month through November. Sponsored by the Diocesan Pro-Life Office, each mass of the “Rosary Novena for Life” is followed by silent praying of the rosary in procession to a local abortion clinic. The church is located at 500 Parker Avenue at Parkside in Buffalo. For other events in the Buffalo diocese, click here for more info. 3/26 (Monday): Feast of the Annunciation "Day of the Unborn Child" - Rosary at 5:45, then Mass at 6:00 PM, Church of the Holy Innocents, Pontifical Mass with Bishop Timlin of Scranton (Emeritus), Organist and choirmaster, Pedro d'Aquino, Missa O soberana luz, by Portugese composer Filipe de Magalhães (c1571-1652). Sponsored by Regina Coeli and Agnus Dei Councils. For info visit the ProLife Amarillo Website. Special events include an annual Respect Life Banquet held on or near the Feast of the Annunciation. March 25 (Fri.) For a calendar of events see www.aveherald.com. This year's events at Ave Maria University include the official unveiling and dedication of the Annunciation sculpture on the Oratory façade -- most events are free and open to the public, with the exception of the luncheon which requires a ticket/RSVP. See website for more details http://www.avemaria.edu/Unveiling/. For information and reservations: 239-280-2420. Contact your local parish for Masses and events throughout the Peoria diocese. Come join Msgr. Thomas Toale and area pro-life groups in a celebration of life on Friday evening, March 25 at St. Raphael's Cathedral in Dubuque. The evening will open with the Rachel Rosary at 6:25 pm followed by Mass for the Day of the Unborn at 7:00 pm. The Knights of Columbus will provide refreshments in the Cathedral Center following Mass. Knights of Columbus Council 13388 from Christ the King Parish in Mashpee, MA is leading the Rosary for the Unborn Friday March 25 followed by Mass. Day of the Unborn Child, March 25th, The Solemnity of the Annunciation. On the day the Church celebrates Our Lord becoming an unborn child, please join us in praying for all unborn children. Church of the Holy Spirit, 515 Albert Street, Saint Paul, MN 55116. Stations of the Cross at 5:30 p.m., Rosary for Life and Divine Mercy Chaplet immediately after. Mar. 24 (Thu.) 7 p.m. Annunciation Mass for The Day of the Unborn Child. St. Aloysius Gonzaga in Cheektowaga at 157 Cleveland Dr. (at Century Rd.). Click here for more info. Fr. David Richards, newly-ordained priest of the Diocese, will be the Celebrant. Sponsored by the Bishop Benincasa Council of the Knights of Columbus. St. Amelia Parish will be hosting a Night of Prayer for the Unborn Child on the Feast of the Annunciation, Friday, March 25. Mass will be celebrated at 7:00 pm, followed by Eucharistic adoration, prayers and reflective prayer time. The night will conclude with Benediction. St. Amelia Parish, 2999 Eggert Road, Tonawanda. All are welcome! For more information contact the office of pro-life activities 847-2205. Click here for more info. Mar. 26 (Sat.) The first of 9 consecutive monthly pro-life masses begins on the last Saturday of March. The masses (8 am at St. Rose of Lima Church in Buffalo) continue each month through November. Sponsored by the Diocesan Pro-Life Office, each mass of the “Rosary Novena for Life” is followed by silent praying of the rosary in procession to a local abortion clinic. The church is located at 500 Parker Avenue at Parkside in Buffalo. Click here for more info. For info visit the http://www.traditionalknight.com/. March 25. A solemn Pontifical Mass (ordinary form) will be celebrated on the Solemnity of the Annunciation of the Lord, 25 March, at 6:00 P.M., at the Church of the Holy Innocents in midtown Manhattan (128 W. 37th St.), New York City. Cardinal Sean O'Malley, O.F.M. Cap., Archbishop of Boston, will be the principal celebrant. The Mass, which will feature ample use of Gregorian chant and polyphony (Mass VIII, Credo III, Palestrina's Missa Brevis in F, concludes the "professional day" of the Catholic Education Foundation's biennial symposium, to be followed by a gala dinner. Concelebrating will be Frs. Peter Stravinskas, Executive Director of CEF, and Thomas Kallumady, Pastor of Holy Innocents. Mr. Robert Prior (Church of Our Saviour, New York City) will be the organist and director of the schola. For info visit http://www.innocents.com/. Plans for the day include a traveling full-size replica image of the Our Lady of Guadalupe tilma brought to the 40 Days For Life location Planned Parenthood in Ogdensburg diocese (Plattsburgh, NY) for prayer from 2-4 p.m.
At 7PM there will be a Holy Hour for Life including adoration of the Blessed Sacrament and praying the pro-life meditations of the rosary at St. Bernard's Parish in Saranac Lake, NY (Adirondack Mountains) in the Diocese of Ogdensburg. Clustered parishes of St. Boniface, Olfen, St. Thomas, Miles, and St. Joseph, Rowena, TX will have a holy hour for the unborn from 6:30 p.m. to 7:30 p.m., Friday March 25 at St. Boniface, Olfen, Texas during Forty Hours Devotion of the parish. The following are planned: readings from Mass will be read, a homily, KC pro-life intercessions, a rosary will be prayed using meditations from the Priests for Life website, a blessing for expectant couples, and the litany for life from the USCCB website. March 25. Knights of Columbus Council #9685 of North Fond du Lac, WI will be holding a special sung rosary prayer service at 12:00 PM at Presentation Church followed by the beginning of the spiritual adoption program. Note: In many areas the Day of the Unborn Child will be celebrated on Mar. 27 in 2011. Click here for info from fli.org.au or go directly to their events page for the Day of the Unborn Child. Mar. 27 10:30 am -- Mass at St. Mary's Cathedral, Sydney, celebrated by Bishop Julian Porteous, 12 pm Angelus and prayerful street procession, 1:30 pm Benediction of the Most Blessed Sacrament at the Cathedral, 2 pm "40 Days for Life" Midpoint Rally at St. Mary's Cathedral hall. Click here for the flyer graphic. Click the following link for the Day of the Unborn Child spiritual adoption program -- Adopcion Espiritual -- Spiritual Adoption. Read about the international movement in favor of life promoting "a day without abortion" each 25th of March, and more about the "day without abortion" initiative here. Every 25th of the month in 5 parishes of the Archdiocese of Quito there is a Mass for the unborn child and the blessing of pregnant mothers. The ultimate special event to celebrate the feast day is a pilgrimage to the Annunciation church/basilica in Nazareth, where an inscription inside states "The Word was made flesh here." Click here for information on pilgrimages to Nazareth's Annunciation church. Click here to visit the official site of the basilica, and here for the webpage featuring a video on the new pilgrim's tour that combines the basilica with the archaeological site (click the four-arrows box in the lower right YouTube screen for full size image). A mini photo slide show from the archaeological museum can be viewed here. There is also an informative ChristianNewsToday article on how the Annunciation feast is celebrated in Nazareth available here -- events include a special Mass, a traditional parade, and guided tours by the Nazareth Cultural and Tourism Association highlight Mary's Well Square, the Greek Orthodox Annunciation Church, Pilgrims' Route, the House of Culture and Art, Alleys of the Old City, and the Basilica of the Annunciation. For a site that includes one pilgrim's insights on the import of the March 25th feast inspired simply from driving by the Annunciation basilica, click here. Consider a pilgrimage to The Holy House of Loreto in Loreto Italy, also known as the Santa Casa di Loreto, long visited as an Annunciation pilgrimage site. According to tradition, the actual house in Nazareth where the Annunciation/Incarnation took place was moved to Loreto. A basilica was built at the site--Basilica of the Holy House (Basilica della Santa Casa)--click here for the official website. A pictorial tour of the Holy House can be found here. Click here for more information on pilgrimages to Loreto, including the "armchair" pilgrimage video that aired on EWTN hosted by Bob and Penny Lord available here. Other video pilgrimages available include two from EWTN's Religious Catalogue--"Loreto: The Mystery of the Holy House" (click here for info on this item # 20445) and also "Forgotten Heritage: Europe and Our Lady" (click here for item # HDFH2) which is a combined set that features Loreto among other important locations including the Annunciation-themed pilgrimage site of Walsingham in England. Videos such as these can be shown for church groups, family gatherings, and individuals if an actual pilgrimage isn't possible. You can also take virtual on-line tours and view website pictorials of Loreto. For information on events click the following link and contact the organization. The bottom of their English translation page notes that in 1999 "The Polish Association for Human Life Protection was registered on the 25th March" -- 25 marzec. For the most current info visit http://blog.sanandresarrixaca.es/ that includes the links to the materials below -- and also check the websites at http://sialavida25m.org/ and http://veladas25.org/ for more information. Given the nearly one-thousand year history of Walsingham as an Annunciation pilgrimage center, consider honoring the day with a visit to one of its shrines--click here for more info on both the Anglican and Catholic shrines of "Walsingham--England's Nazareth". Consult the shrines’ events and calendar pages for current schedules. If an actual pilgrimage isn't possible, consider an armchair pilgrimage via virtual on-line tours and pictorials. Click here for travel/tour information including a map. More info on visiting Walsingham including photos can be found here--(pause cursor over picture to get a caption). Click here for additional tour/pilgrimage information and then scroll down for a mini photo tour. An informative article on Walsingham with pictures can be found here. EWTN Religious Catalogue (1-800-854-6316) offers a video pilgrimage that combines Walsingham with other significant locations including the Annunciation-themed site of Loreto--"Forgotten Heritage: Europe and Our Lady" (click here for the combined set item # HDFH2). Also available from EWTN on DVD is a beautiful historical and visual tour of "Walsingham: England's Nazareth" (alternately titled "Walsingham: England's National Shrine Of Our Lady" or simply "The Story of Walsingham") hosted by Joanna Bogle (click here for info): In this special Fr. Noel Wynn (director of the Catholic shrine) is interviewed at the Slipper Chapel. Asked by the host if Walsingham is indeed finding its place once again in the 21st century, he replies: "I think perhaps more so than ever. The message of Walsingham is the message of the Incarnation." Another distributor offers an equally lovely video that can serve as a virtual pilgrimage for church groups, family gatherings and individuals that includes more details on the history of Walsingham as dedicated to The Annunciation -- Part 3 of the 4 part series The White Dove of Peace (click here for availability) which aired on EWTN in 2008: Part 3 of the documentary begins with modern-day pilgrims gathered to pray the Angelus near Walsingham on the millennium Feast of the Incarnation, with the following voiceover: "March the 25th 2000, was the two-thousandth anniversary of the Incarnation--the miracle of God coming down from Heaven and making his home with human beings. The simple house at Nazareth and the room where Mary heard the angel's message and where her son was conceived, have long since vanished from Palestine, but in the Middle Ages a replica of it, which was built near here, brought innumerable pilgrims to this place to venerate Mary and to ponder the mystery of the Incarnation." Later on in the program the narration continues: "The message of Walsingham therefore--is the Annunciation"--"By divine providence, Walsingham was destined to become a reminder of Nazareth, in the heart of the English countryside. It is evidence that England had a unique part to play in the purposes of God." For a website that addresses the pro-life import of the Annunciation and Walsingham click here. A book entitled "Walsingham: Pilgrims and Pilgrimage" by Michael Rear is published by St Paul Publishing, London 2011. March 25. For info on local International Day of Unborn events please click here. Prayer Vigil, March 25th, 2-4 PM, at Legislative Hall in Dover. Following the prayer vigil, St. Polycarp Church in Smyrna, Delaware will sponsor the following events: Dinner in Mother Drexel Hall at 5 PM, Rosary for Life - 6:30 PM, Eucharist - 7 PM; Celebrant and homilist will be the Most Rev. W. Francis Malooly--Sponsored by K. of C., Helpers of God's Precious Infants, and Pro-lifers throughout Delaware. March 25. Feast of the Annunciation Mass for the Unborn: St. Aloysius Gonzaga in Cheektowaga at 157 Cleveland Dr. (6:30 pm Rosary, 7:00 pm Mass). Sponsored by the Bishop Benincasa Council Knights of Columbus. Click here for more info. The first of 9 consecutive monthly pro-life masses begins on the last Saturday of March. The masses (8 am at St. Rose of Lima Church in Buffalo) continue each month through November. Sponsored by the Diocesan Pro-Life Office, each mass of the “Rosary Novena for Life” is followed by silent praying of the rosary in procession to a local abortion clinic. The church is located at 500 Parker Avenue at Parkside in Buffalo. Click here for more info. March 25. Solemn Pontifical Mass for Life (Missale Romanum of 1962) for the Solemnity of the Annunciation & Incarnation -- His Eminence, Edward Cardinal Egan, Celebrant -- (7 pm Rosary for Life, 7:30 Mass) The Church of the Holy Innocents, 128 West 37th St. (37th St. between 7th Ave. and Broadway). Reception to follow. For info visit the http://www.traditionalknight.com/. For info visit the ProLife Amarillo Website. March 25. Mass and Rosary at 7 PM March 25 at St. Mary Church in League City, TX. It will be sponsored by St. Mary Council, Knights of Columbus. March 25. The Knights of Columbus of St. John's church in Marble Falls, TX will be having a parish rosary on the 25th to commemorate the Day of the Unborn Child and to pray for an end to abortion. Click the following link for the Day of the Unborn Child spiritual adoption program -- Adopcion Espiritual -- Spiritual Adoption. For the most current info visit -- http://blog.sanandresarrixaca.es. Given the nearly one-thousand year history of Walsingham as an Annunciation pilgrimage center, consider honoring the day with a visit to one of its shrines--click here for more info on both the Anglican and Catholic shrines of "Walsingham--England's Nazareth". Consult the shrines’ events and calendar pages for current schedules. For more details on the history of Walsingham as dedicated to The Annunciation, please see Part 3 of the 4 part series The White Dove of Peace that aired on EWTN in 2008. Part 3 of the documentary begins with modern-day pilgrims gathered to pray the Angelus near Walsingham on the millennium Feast of the Incarnation, with the following voiceover: “March the 25th 2000, was the two-thousandth anniversary of the Incarnation--the miracle of God coming down from Heaven and making his home with human beings. The simple house at Nazareth and the room where Mary heard the angel's message and where her son was conceived, have long since vanished from Palestine, but in the Middle Ages a replica of it, which was built near here, brought innumerable pilgrims to this place to venerate Mary and to ponder the mystery of the Incarnation." Later on in the program the narration continues: "The message of Walsingham therefore--is the Annunciation"--"By divine providence, Walsingham was destined to become a reminder of Nazareth, in the heart of the English countryside. It is evidence that England had a unique part to play in the purposes of God." March 25 -- St. Margaret Mary Parish, 620 S. Cesar Chavez, Brawley, CA 92227, Tel: 760-344-3571. Solemnity of the Annuciation-Day of the Unborn Child. Mass will be celebrated by Fr. Jose Luis Muro @ 6 p.m. -- A special prayer for the unborn will be said during Mass and children will walk in procession with crosses in memory of all the unborn children. Refreshments to follow after Mass. March 25. St. Polycarp Church, 135 Ransom Lane, Smyrna DE 19977, Tel. : 302-653-8279 -- Helpers of God's Precious Infants will oversee a march at Legislative Hall on the Green in Dover (call for exact time)--and in Smyrna at 5 pm Brother Vincent Council of the Knights of Columbus will serve dinner to the marchers and others who come to St. Polycarp in Smyrna for the rest of the day's events. Mass will follow a 6:30 pm Rosary for Life. For more info please click here. March 25 -- Adoration in the chapel at Nativity Catholic Church -- 705 E. Brandon Boulevard -- on Wednesday, March 25 -- the Feast of the Annunciation and the Day of the Unborn Child! Please come from 1:30 to 2:30 p.m. to pray. March 29 -- Sunday -- Concert for Life Luncheon -- special celebration for the Day of the Unborn Child -- 12:00-4:00 pm -- St. Raymond Crystal Palm Ballroom, 3475 SW, 17 St. Miami, FL 33145 -- $20 donation PP. Call Vida Human Internacional for Tickets: 305-260-0525 or St. Raymond 305-446-2427. Click here for more info. Laity for Life is pleased to announce its collaboration with the Respect Life Department of the Diocese of Venice in sponsoring a 2008 Novena of Masses for Life. The term "Novena" refers to the 9-month period of Our Lord's gestation in the womb of His mother - from His Incarnation, which we celebrate as the Solemnity of the Annunciation of the Lord through to His birth celebrated on Christmas Day. March 25 -- Come join Archbishop Jerome Hanus, O.S.B. and area pro-life groups in a celebration of life on Wednesday evening, March 25th at Holy Ghost Catholic Church, Dubuque, Iowa. The evening will open at 6:30 pm with the rosary followed by Mass for the Day of the Unborn at 7 pm. The Knights of Columbus will provide refreshments in Paraclete Hall following Mass. The Dover Knights of Columbus Council #807 “Our Lady of the Rosary” wish to invite all parishioners and their families as well as the Clergy to partake in the praying of four Rosaries for the intention of unity at St. George’s Church on Wed. March 25th -- “The Annunciation of the Lord Feast Day”--the Rosary will begin following the 6 pm Mass -- St. George Maronite Church -- 22 Chapel St.
March 22 (Sunday) Day of the Unborn Child Mass -- 12 pm -- Knights of Columbus Council Hall -- Sponsored by the Knights of Columbus of North Arlington: Noon Mass followed by short march to Rachel statue, concluding with a reception at the Council Hall. Click here for more info. March 25 (Wednesday) -- Feast of the Annunciation Mass for the Unborn: March 25, at 7 pm at St. Aloysius Gonzaga in Cheektowaga. Click here for more info. March 28 (Saturday) The first of 9 consecutive monthly pro-life masses begins on the last Saturday of March. The masses (8 am at St. Rose of Lima Church in Buffalo) continue on the last Saturday of each month through November. Sponsored by the Diocesan Pro-Life Office, each mass of the “Rosary Novena for Life” (is followed by silent praying of the rosary in procession to a local abortion clinic. The church is located at 500 Parker Avenue at Parkside in Buffalo. Click here for more info. Wednesday, March 25, 2009 ~ Pro-Life Solemn High Tridentine Holy Mass ~ Feast of the Incarnation ~ "And the Word was made flesh": Our Lady of Mt. Carmel Church, 627 East 187th Street & Belmont -- Bronx, N.Y. 10458, Tel: (718) 295-3770: 7pm -- The Rosary led by the Sisters of Life, 7:30 p.m. -- Solemn High Mass in the Extraordinary Rite For the Sanctity of Life -- to end abortion -- with Chant and Polyphony. Fr. James Miara, Fr. Richard Trezza -- Deacon, Fr. Michael Barone -- Sub Deacon. Sunday, March 22, 2009 -- Free Concert followed by Lecture and Refreshments: A Tribute to Mary Concert with Vocalist (soprano) Madelon Kinzig with Dr. Ritter Werner accompanist and violinist John Root. 7:00 p.m. St. Anthony Church--830 Bowen St. (US 35 East to Steve Whalen Blvd. ; left on Wyoming, left on Bowen). Followed by a 7:40 p.m. presentation by Al Langsenkamp of the Langsenkamp Family Apostolate on “Our Lady of America--her messages, warnings, and promises.” Refreshments and “Our Lady of America” materials will be available. Wednesday, March 25, 2009 -- “Annunciation and Incarnation of the Lord” Celebration. Our Lady of Mercy Church -- 220 West Siebenthaler Ave. off N. Main St. Dayton (Siebenthaler is 2.4 miles north of I-75 & N. Main St.) 7:00 pm Solemnity Mass of the Annunciation, followed by 8:15 pm talk on “Living a Consistent Ethic of Life” by Fr. Thomas A. Thompson, SM, PhD, Dir. of the Marian Library International Marian Research Institute--Refreshments and displays in the OLOM lower level following Mass. March 25: 7:00 p.m. St. Mary's Church. Address: 1612 E. Walker St. Phone: 281-557-3378. The Knights of Columbus are sponsoring a special Mass at 7:00 p.m. on March 25, commemorating the Day of the Unborn Child. The Fourth Degree Color Corps will be present. March 25: 12:10 p.m. Presentation Parish and local Knights of Columbus Councils will again be praying a sung rosary with accompanying prayers and spiritual adoption pledge program on Wednesday at Presentation Church, North Fond du Lac, beginning at 12:10 p.m. All pro-life advocates are invited. The bishops in Spain have declared 2009 a "Year of Prayer for Life" with the theme "Blessed be the fruit of thy womb" and they are planning special prayer events in the parishes for March 25, which in Spain they call "World Day for Life." Note: The bishops in Spain have declared 2009 a "Year of Prayer for Life" with the theme "Blessed be the fruit of thy womb" and they are planning special prayer events in the parishes for March 25, which in Spain they call "World Day for Life." March 31st (Monday) -- St. Polycarp Parish in Smyrna Delaware will have the rosary and a Mass for the Unborn for the Feast of the Annunciation. Rosary at 6:30 PM, with Mass at 7 PM. The church is on South Street, 1/2 mi. from U.S. #13. (302) 653-8279. The term "Novena" refers to the 9-month period of Our Lord's gestation in the womb of His mother - from His incarnation, which we celebrate as the Solemnity of the Annunciation of the Lord [rescheduled this year, from the usual March 25 to March 31, due to Easter Day falling on March 23] through to His birth celebrated on Christmas Day. This 9-month period will be specially observed with a series of Masses celebrated around the Diocese, beginning on March 31 with Mass at Epiphany Cathedral, and continuing with Masses around the diocese on the 25th of each month, from April 25 through November 25. Each Mass will be offered for the special intention of "a greater respect for all human life," and each will present a special opportunity to meditate on the progressive development of Our Lord in His mother's womb, just as each of His beloved human creations develops in his or her mother's womb. The Most Rev. Frank J. Dewane, Bishop of the Diocese of Venice, will honor the commencement of the 2008 Novena of Masses for Life by celebrating the Mass of the Solemnity of the Annunciation on March 31, 2008 at Epiphany Cathedral, 350 Tampa Avenue West, Venice FL at 11:00am. Mass will be followed by a catered luncheon at the Cathedral’s parish hall on Harbor Drive in Venice [at the rear of the Cathedral building] from 12:00pm to 2:00pm, with Bishop Dewane as special guest speaker. Everyone is welcome to join us for both the Mass and the luncheon. No reservations are necessary for the Mass. Pre-paid reservations for the luncheon are required by no later than March 24, 2008. Tickets are $25 each and will be held at the door. To make your pre-paid luncheon reservation, please send your name, mailing address, telephone number and check made payable to Laity for Life, Inc. to Laity for Life, P.O. Box 111478, Naples FL 34108. For additional information about the 2008 Novena of Masses for Life, the Cathedral Mass of the Solemnity of the Annunciation of the Lord or the luncheon with the Bishop, visit the Laity for Life website at www.laityforlife.org or call us at (239) 352-6333. March 31 (Monday) -- The 12th Annual Feast of the Annunciation Celebration: Concelebrated Mass and Neighborhood Candlelight Procession; Monday, March 31 2008, 7:00 pm, at Our Lady of Victory Church, 5212 W. Agatite, Chicago. Participants are encouraged to bring their children to participate in the mass and procession (please bring candles). For further information call (773) 318-3608. This event is sponsored by the Officers and Members of Tonti Council #1567 Knights of Columbus. March 31 (Monday) -- The Feast of the Annunciation -- The International Day of the Unborn Child: St. Ferdinand Church, 5900 West Barry, Chicago, IL 60634. The Knights of Columbus Mater Christi Council #14284 cordially invite you and your families to join them for 7:00 pm Mass, outdoor candlelight procession, and benediction. Mass will be celebrated by Most Reverend Tad Jakubowski and concelebrated with priests from the parishes. After benediction all are invited to St. Ferdinand’s Chapel Hall for refreshments. An Honor Guard is requested to arrive by 6:30 pm. For more info please call Tony Mangiaracina (773) 202-0234. March 31 (Monday) -- Come join Archbishop Jerome Hanus, O.S.B. and area pro-life groups in a celebration of life on Monday evening, March 31 at St. Raphael’s Cathedral, Dubuque, Iowa. The evening will open at 6:30 pm with the Rachel Rosary, followed by Mass for the Day of the Unborn at 7 pm. The Knights of Columbus will provide refreshments in the Cathedral Center following Mass. March 25 (Tuesday) -- Feast of the Annunciation Mass for the Unborn: March 25, at 7 pm at St. Aloysius Gonzaga in Cheektowaga. March 29 (Saturday) -- The first of 9 consecutive monthly pro-life masses begins on Saturday March 29 at 8 am at St. Rose of Lima Church in Buffalo. Sponsored by the Diocesan Pro-Life Office, each mass of the “Rosary Novena for Life” (on the last Saturday of each month ending Nov. 29) is followed by silent praying of the rosary in procession to a local abortion clinic. March 31 (Monday) -- “A Day of Eucharistic Adoration -- Feast of the Annunciation” at St. Augustine Church, 425 Penora St. in Depew, NY (Fr. Conrad P. Stachowiak, Pastor): Exposition of the Blessed Sacrament throughout the day following the 8:30 am Mass; Divine Mercy Chaplet at 3 pm; Rosary at 6:30 pm; Mass at 7 pm with Procession, Consecration to the Sacred Heart of Jesus and the Immaculate Heart of Mary and Benediction. All are welcome to attend. Mr Al Langsenkamp will speak on Our Lady of America--her message, warnings, and promises. 7:00 pm Solemnity Mass of the Annunciation, Presider & Homilist Rev. David Brinkmoeller, Pastor--St. Helen Parish, & Dean--Dayton Deanery. 8:15 pm "What Does John Paul II's Theology of the Body Teach us about the Incarnation--and vice versa" by Perry J Cahall, PhD, Assistant, Professor of Historical Theology, Pontifical College Josephinum, Columbus, OH. Sponsored by St Helen Parish, the International Marian Research Institute, Knights of Columbus and One More Soul. Refreshments and displays in the Helen Room following Mass. March 31 (Monday) -- At 4:00PM, March 31 (Feast of the Annunciation, transferred), Knights of Columbus Woodlawn Council 2161 will conduct its 7th annual recitation of the Holy Rosary to end abortion. Mount Olivet Catholic Cemetery, 2186 Brodhead Rd, Aliquippa (Hopewell Twp) PA 15001, lower level, at KofC memorial to the victims of abortion. In the event of rain, gather in the cemetery chapel. March 31 (Monday) -- Diocesan Respect Life Mass. You are invited to attend the 4th Annual Diocesan Mass…To Celebrate the Annunciation of the Lord, on March 31, 2008. Time: 7:00PM. Place: St. Martha's Church, 2595 Pawtucket Ave., East Providence, RI. Rev. Msgr. Paul D. Theroux, STB, JCL (Vicar General) Main Celebrant & Homilist; Rev. Douglas J. Spina (Pastor St. Martha's Church) Concelebrant; Rev. Paul F. Reynolds (St. Martha's Church); Deacon Frederick Young (St. Martha’s Church) Deacon of the Mass. All guests are asked to bring a gift for the baby shower & coffee hour that will be held in the parish hall following Mass. Suggested gift items: $10 Gift Certificates, Diapers (infant to toddler), Play outfits, Sleepers, Onesies, Blankets, Baby toiletries & other necessities (powder, lotion, q-tips, food, baby wipes, shampoo, baby bottles…) Please bring gifts unwrapped!--gifts will be for the Diocese of Providence's Gabriel Project and donated to other problem pregnancy agencies in the area. (St. Martha's Parish, as an extra effort to encourage donations, will be inviting parishioners to bring a baby gift to each Mass on the weekend of March 29/30). For more information and directions call Carol Owens, Respect Life Office Coordinator, at 421-7833 X 118. March 25 (Tuesday) -- A Baby Shower for Mary's Annunciation -- (Diocese of Charleston) -- Saint Philip Neri Catholic Church, 292 Munn Road, Fort Mill, SC. Family First will be collecting baby items as a service project throughout the last three weeks in March. Please bring your baby shower gifts (diapers, wipes, clothes, bottles, formula, baby food, etc.) into the Gathering Space (look for the crib). All items will be donated to Room At The Inn, a Catholic Maternity home in Charlotte. For more info, or if you have a large item for donation, please visit http://spnfamily.googlepages.com. Saturday--April 5th: The Catholic Pro-Life Committee, the Respect Life Ministry of the diocese of Dallas, will be hosting, along with Bishop Kevin Farrell, the 15th Annual Bishop's Pro-Life Dinner on Saturday, April 5th 2008 at the Hilton Anatole, 2201 Stemmons Freeway, Dallas. The keynote speaker will be Fr. Frank Pavone of Priests for Life. Visit the prolifedallas.org website for more information. Credit card reservations may be made by phone at 972-267-LIFE (5433). Spanish translation headsets will be available. Call 972-267-LIFE (5433) to reserve. March 31 (Monday) -- Mass for the Unborn (delayed Feast of the Annunciation) at noon -- Sacred Heart Cathedral. Click to download promotional .pdf flier for distribution. Suggested Bulletin Text: COME CELEBRATE THE DAY OF THE UNBORN CHILD: Come join in the celebrations for the Day of the Unborn Child at St Mary's Cathedral, Sydney, Sunday 6th April 2008. 10.30am High Mass celebrated by Bishop Desmond Moore, followed at 12.00 noon by Angelus led by Bishop Terry Brady, followed by prayerful procession through the CBD, and back to the Cathedral by 1.30pm for concluding Benediction. The Day of the Unborn Child was first instituted, with the approval of the Holy See, in Argentina on the Feast of the Annunciation in 1999 and has become an annual event in several countries around the world. For information please call Family Life International on: 95195111 or visit www.fli.org.au. March 25 (Tuesday) -- “The Knights of Columbus has scheduled the Rosary for the cluster parishes of Mount Carmel/St. Joseph’s in both churches on Tuesday, March 25. These prayers offered on the traditional feast of the Annunciation will promote the feast of the Day Of The Unborn Child. Members of the Knights Of Columbus St. Mary’s Council will recite the rosary.” (Please call the parishes or council for times). Tignish: This year the Day of the Unborn will be observed on March 31st at St. Simon and St. Jude Catholic church in Tignish, PEI. There will be a Holy Hour with exposition of the Blessed Sacrament as well as benediction and praying of the rosary before the Holy Mass at 6:00 pm with Father Melvin Doucette as the celebrant. A presentation by Mr. David Little (friend of the late Mother Teresa and Pope John Paul II) will follow. Monday, March 26--World Day of the Unborn--5 pm. For the third year in a row, the pro-life committee at St. Polycarp and the State Council of the Knights of Columbus are sponsoring a gathering in Smyrna. There will be a free dinner at 5 pm, followed by a 6:30 pm Rosary and 7 pm Eucharist. Bishop Saltarelli will preside and Fr. Peter West from Priests for Life will preach. The church is on South Street, ½ mi. from U.S. #13. (302) 653-8279. Sunday March 25, 2007 following 8am, 10am and noon Mass. Cathedral of St. Mary of the Immaculate Conception, 607 NE Madison Avenue, Peoria, IL 61603. For more info: 309-671-1568. A reception will be held immediately after at the Family Resources Center. Diocesan ProLife and ProFamily organizations will display their services during the reception. Mason City, Iowa. A potato bar in the Holy Family basement will follow the mass. Monday March 26--International Day of the Unborn Child--Holy Family Church Parish Hall, 6:00pm (Prayer Service). Location: The Parish Hall is next to the Holy Family Catholic Church in West Branch, Michigan at 402 W. Peters Rd. Monday evening, March 26, 2007 at 7:00 pm at St. Michael the Archangel. Address: 624 Page Ave., Lyndhurst, NJ 07071. Phone: (201) 939 -1161. St. Michael’s will observe the 6th annual International “Day of the Unborn Child” Mass. As we meditate upon the Annunciation of the Lord, let us all renew our commitment to building a culture where every life is welcomed, respected and protected by law. Please join with us on March 26th for this most important celebration. Sunday March 25--International Day of the Unborn beginning at 12 pm. Queen Of Peace Church, 191 Rutherford Place, North Arlington, NJ 07031-6094. Phone: (201) 991-0235. Begins with noon mass at Queen of Peace Church (North Arlington) celebrated by Bishop Charles McDonnell, Knights of Columbus State Chaplain. Father Scott, Parochial Vicar of Queen of Peace Church will be the Master of Ceremony. After the mass, Exposition of the Blessed Sacrament. Procession from Queen of Peace Church, north on Ridge Road to Holy Cross Cemetery. (Approx. 4 blocks). In procession lead by the Fourth Degree Honor Guard, followed by the litany, followed by 48 expectant moms, moms, grandmothers, carrying blue, white and pink candles representing the estimated 48 million babies aborted since Roe vs. Wade. Reciting the rosary during the procession through an audio system. The Blessed Sacrament will be carried in procession to the cemetery. Enter main entrance of cemetery (Ridge Road), and proceed to the new Mausoleum Chapel. Benediction at the Chapel. After Benediction, the congregation will proceed out of the Mausoleum to Rachael’s monument (Monument to the Unborn), placing the candles at the monument. Rededication of the monument. Speeches and presentation of dignitaries (weather conditions permitting). Back to the council for refreshments and recognition of the expectant moms. Presentation of checks to the various Respect Life Organizations. The nine-month Rosary for Life begins in late March near the feast date and ends as the Christmas season is getting underway. This year it begins on March 31st, and continues on the last Saturday of each month through November. Each gathering opens with the 8:00 a.m. Mass at St. Rose of Lima Parish, Parkside & Parker Avenues, Buffalo followed by procession to pray across the street from the clinic on Main Street. The 3rd Annual Diocesan Annual Diocesan Mass To Celebrate the Annunciation of Jesus to Mary - - “Human Life - Divine Gift!” - - will be held at St. Martha’s Church, 2595 Pawtucket Avenue, East Providence, RI, on Monday, March 26th beginning at 7pm. Our Main Celebrant & Homilist will be Rev. Michael A. Colello, Administrative Secretary to the Bishop. Concelebrants are: Rev. Douglas J. Spina, Pastor St. Martha’s Church, Deacon Assistant Deacon Fredrick Young, Deacon St. Martha’s Church. All guests are asked to bring a gift for the baby shower following Mass. Suggested gift items: $10 Gift Certificates (CVS, Brooks, Shaw’s or Stop & Shop),..Diapers, play outfit, onesies, bibs, socks... Powder, lotion, q-tips, food, wipes, shampoo, baby bottles…use your imagination! A coffee hour and baby shower will be held in the parish hall following the Mass. Gifts will be donated to the Diocese of Providence’s Gabriel Project and other problem pregnancy agencies. St. Martha’s Parish, as an extra effort to encourage donations will be asking parishioners to bring a baby gift to each Mass on the weekend of March 24th/25th. This event is sponsored by the Respect Life Office of the Diocese of Providence and is being hosted by St. Martha’s Church. March 26--In honor of the Annunciation. St. Mary Help of Christians in Aiken will be having a special blessing and reception for new moms and all expectant mothers on Monday March 26 after the 8:30 am Mass. The Rosary Prayer Group’s Annunciation Novena at St. Philip Neri Church in Fort Mill. Phone for info: (803) 548-7282. March 26--Father Gregory Wilson will lead Our Lady Star of the Sea Parish at the dedication of a monument to unborn following the 8:00 Mass on Monday, March 26 2007 at the east side entrance to the church. This monument is in the form of a statue of Our Lady of Guadalupe, "Patroness of The Unborn" noting that Life is a Gift from God. (This dedication is appropriately taking place on the Feast of the Annunciation. The Annunciation feast date is also the day on which the Knights of Columbus celebrate the International Day of the Unborn. Fourth Degree Knights from Our Lady Star of the Sea Council and other surrounding Assemblies will provide an honor guard for this event. On Sunday March 25, St. Mary Magdalene Church in Simpsonville will be doing a "Babies World Walk" from 1:00-4:00 pm with all donations going to Birthright. If you would like to contribute send donations to: Babies World Walk, 213 Vaughn Rd, Greer, SC 29651. 6:30 p.m., in the Chantilly Ballroom of the Hilton Anatole Dallas, 2201 Stemmons Freeway. Keynote speaker is Jennifer O'Neill, model, actress, author and celebrity spokeswoman for the Silent No More Awareness Campaign. Reservation price is $60 for an individual seat and $600 (and up) for a table of ten, $45 for a student ticket. Ticket price includes parking. Reservation deadline is March 9, 2007. Tables seat 10 guests. Credit card reservations may be made by phone, 972-267-LIFE, or online. Click here for more info, or here to make a reservation. Call the CPLC office, 972-267-LIFE, to reserve. Silent Auction and Exhibits beginning at 5:00 p.m.
Sunday March 25--Day of the Unborn Child. Time: 8:30 AM-10:00 AM. Location: St. Mary’s Church. Address: 1612 E. Walker St., League City, TX, 77573. Phone: 281-557-3378. Details: Pro-Life Mass with participation from the 4th Degree Knights. The Mass will be followed by a Rosary procession led by the Knights. Monday March 26--The Catholic Diocese of San Angelo will have a Mass at noon Monday, March 26, to celebrate the Day of the Unborn at the Cathedral Church of the Sacred Heart, 19 S. Oakes St. For more information, call (325) 651-7500. Three-hour adoration on March 25th from 9:00pm to midnight at three local Catholic parishes: Sacred Heart Parish, St. George Parish, and the St. Joseph Chapel at St. Michael Parish. Details for St. Michael Parish: Celebrate the Feast of the Annunciation Sunday March 25th, 9pm to Midnight at St. Michael Parish in St. Joseph Chapel. Come pray for the unborn. Sponsored by the Knights of Columbus #1643. Address: St. Michael Parish, 1021 Boundary Street SE, Olympia, WA 98501. Phone: 360-754-4667. This is an annual event celebrated in all Australian capital cities. 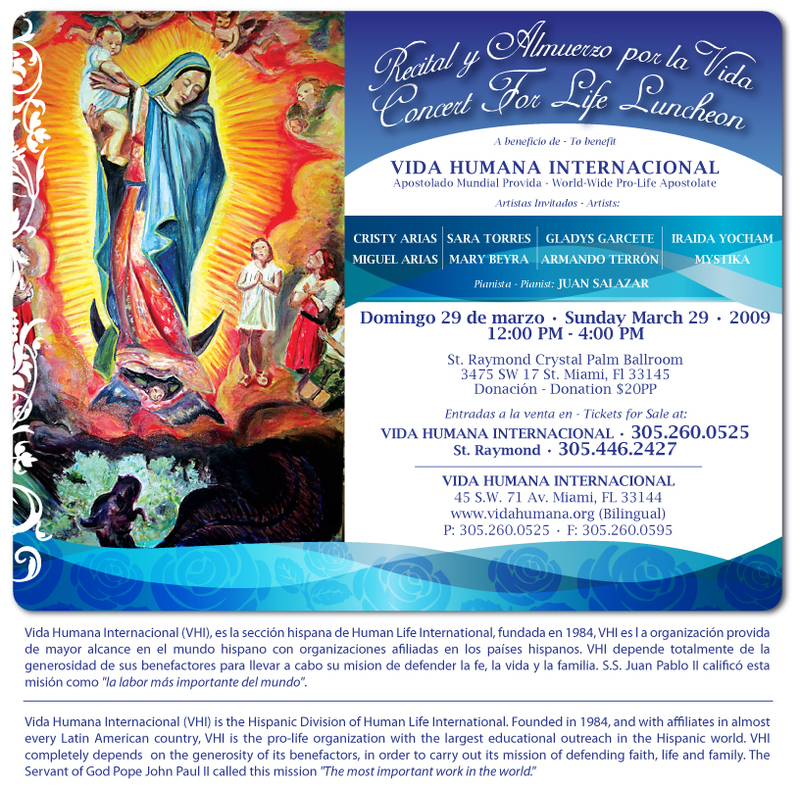 Vida Humana Internacional (Human Life International's Hispanic Division in Miami) is co-organizing with its Mexico affiliate, an international pro-life conference in Mexico City March 23-25. Pro-lifers are participating from all over this hemisphere and from Spain. It will be inaugurated March 23 with a mass at the Basilica of Our Lady of Guadalupe, which will be celebrated by Cardinal Lopez Trujillo and concelebrated by Cardinal Rivera Carrera, archbishop of Mexico City. Cardinal Rivera Carrera requested that this conference be celebrated on the occasion of the Day of the Unborn. For more info Consult the Vida Humana Internacional website at http://www.vidahumana.org, where there will be a link to the program of the international pro-life conference. All Catholic women, English or Spanish speaking, are invited to participate in a Women's Day of Prayer March 25, which will focus on "Mary, Companion of Our Lenten Journey." "On the Feast of the Annunciation, we gather to reflect on Mary in the past as we see her in the scriptures, the present as we relate to her in our daily lives, the future as we journey and envision how Mary can be our helpful companion for the rest of Lent, Easter and beyond," said the Sisters' Council. Sister Beth Mulvaney, CSC, Darlyne Pape, and Sister Maria Elena Schaefers, OSB, will present the retreat. Sponsored by the Diocesan's Sisters' Council, the day will take place at Nazareth Retreat Center, 4450 N. Five Mile Road, Boise, from 9 a.m. to 3 p.m. The cost is $10, which includes lunch. Registration deadline is March 22. Brochures are available at parishes. Mail registration fee and name, parish and address to: Sister Mary Louise Deroin, CSC, 4702 N. Patton Place, Boise, ID 83704. No childcare is available. Overnight arrangements can be made at Nazareth, 208-375-2932. Each participant is encouraged to bring her favorite image of Mary - a picture, statue or Rosary. The day will include presentations, personal reflection, group sharing, lectio divina in English and Spanish, prayer, and fellowship. We encourage you to participate in our Spiritual Adoption Program and pray daily for the life of an unborn child over a 9-month period. We will begin on March 26th of 2006. [Image of newborn with text “Please pray for me to be born.”] A Spiritual Adoption Baby Shower will be held in nine months. Program Duchowej Adopcji jest projektem, który duchowo i materialnie wspiera nienarodzone dzieci i ich matki. Uczestnicy “Duchowo Adoptują” nienarodzone dziecko i składają przyrzeczenia modlitwy w ich intencji przez dziewięć miesięcy. Boże Narodzenie 2006, będziemy obchodzić „narodziny” adoptowanych dzieci. Saturday March 25 -- “The Annunciation: Cherishing Human Life from the Moment of Conception--A day of education, inspiration, networking and fellowship, featuring national speakers from across the United States.” 8:00 a.m. to 4:00 p.m., The Willows Academy, 1012 E. Thacker St., Des Plaines, IL 60016. Admission $25 ($15 high school and college)--includes breakfast, lunch, materials. Register by March 17--contact the Archdiocese of Chicago Respect Life Office at 312.751.5355. Hosting the Mass for Life, Saturday, 25 March 2006 4p.m. March 25, 2006, 4pm--Cathedral of St. Mary of the Immaculate Conception, 607 NE Madison Avenue, Peoria, IL 61603. Bishop will bless expectant couples. Reception to follow in the Franz Center with displays from diocesan respect life organizations and agencies as well as posters and artwork depicting the Annunciation from school children around the Diocese of Peoria. The Cathedral and other parishes have chosen to launch the “spiritual adoption” program this year on the Feast of the Annunciation. Some have chosen the following day of Sunday 26th (due to greater mass attendance). Contact your local church for details. March 25, 2006, Respect Life Conference, 8:15 AM - 3:30 PM, St. Anthony of Padua Parish, Mother Mary Lange School Hall, 4414 Frankford Ave., 21206. Full day of speakers addressing various aspects of the pro-life movement. Keynote speaker: Dr. Alveda King, niece of Dr. Martin Luther King. Other speakers: Dr. Theresa Burke, Rachel Vineyard Retreats, Dr. Joel Brind, expert on the abortion-breast cancer link, Fr. Jim Farmer on US Supreme Court decisions in history. For info contact Linda Brenegan at 410-547-5537. Friday, March 24--Annual Mass for Life. All are invited to attend the annual Mass for Life, celebrating the Feast of the Annunciation of the Lord, on at 10:00 a.m. at the Cathedral of St. Paul, 38 High St., Worcester, MA 01609. The diocesan pro-life awards, presented to individuals who have shown heroic witness to the sanctity of human life, will also be presented at this liturgy. Please join us in prayer for an increased reverence for the dignity of the human person. Note to Clergy: All are welcome to concelebrate at the Mass for Life. Please let the Office for Worship know if you will be able to do so by calling 508-798-0417. 10:00 a.m., March 25--Mass at St. Cecelia's in Iselin, 45 Wilus Way, 08830 -- e-mail jruggiero@diometuchen.org at the Diocese of Metuchen pro-life office for more info. St. Rose of Lima's--8 a.m. mass. [March 25th begins the diocesan Rosary Novena for Life. 8 a.m. mass will be followed by Rosary and procession to pray across the street from the clinic on Main. It will be the first of nine monthly gatherings to pray for an end to abortion and give witness to the dignity of all human life.] The church is located at 500 Parker Avenue at Parkside in Buffalo. Thursday, March 23, 7:00 p.m. at St. Aloysius Gonzaga Church, 157 Cleveland Dr., Cheektowaga. Mass for the Day of the Unborn Child. Sponsored by the Knights of Columbus. Priests for Life and Respect Life Ministries are excited to present a Lenten Pilgrimage and Days of Reflection at the Bishop DeFalco Retreat Center in Amarillo for those who work and pray for respect for human life. The pilgrimage will begin on March 25, the Anniversary of Evangelium Vitae (The Gospel of Life), the Feast of the Annunciation & will continue through March 26, culminating in the Annual Respect Life Banquet. Saturday, March 25 ~ 8:00 a.m. ­ 4:30 p.m. This day includes Mass and three talks by Fr. Frank Pavone, time for confession and quiet prayer, and a Holy Hour. Overnight accommodations will be available on first-come first-served basis. Sunday, March 26 ~ 9:00 a.m.
Mass celebrated by Bishop Yanta followed by a pilgrimage to the 190 foot tall Cross in Groom where Fr. Frank Pavone will lead Stations of the Cross. There will be time to tour the grounds, meditate upon the beautiful bronze Stations of the Cross that have attracted millions of visitors, and enjoy the gift shop. The tour group will return to the BDRC for rest and quiet prayer time until 4:00 p.m. when guests will depart for the Civic Center Grand Plaza to attend the annual Respect Life Banquet featuring Dr. Alveda King, niece of Dr. Martin Luther King, Jr., with Fr. Frank Pavone, National Director of Priests for Life. For registration information please contact Vickey Martinez, Events Coordinator for Respect Life Ministries, at 806-690-4694. Dr. Alveda King, niece of Dr. Martin Luther King, Jr., and Fr. Frank Pavone, National Director of Priests for Life, will be the featured speakers at the annual Respect Life Banquet to be held at the Civic Center Grand Plaza at 5 p.m. on Sunday, March 26. On the menu is prime rib and all the trimmings. Many unique silent auction items will be offered. Tickets are $35 for individuals or $250 for a table of 8. Tickets are available from Knights of Columbus members or by calling Shelley Sample at 806-379-9224. This is a great opportunity to meet many of the priest associates and staff members of Priests for Life. The banquet is sponsored by Respect Life Ministries of the Diocese of Amarillo, Fourth Degree Knights of Columbus, and Priests for Life, and will benefit Respect Life Ministries. March 25: The Bishop's 13th Annual Catholic Pro-Life Dinner. "Say 'Yes' to Life!" The Most Reverend Charles V. Grahmann invites you to attend The Bishop's 13th Annual Catholic Pro-Life Dinner benefiting the Catholic Pro-Life Committee of North Texas: 6:30 p.m., in the Khmer Pavilion (Third Level, Atrium Entrance) of the Hilton Anatole Dallas, 2201 Stemmons Freeway. Keynote speaker is Michael Medved, author, film critic, and nationally syndicated radio talk show host. Don't miss this spectacular evening! Reservation price is $55 for an individual seat and $550 (and up) for a table of ten, $45 for a student ticket. Ticket price includes parking. Reservation deadline is March 17, 2006. Tables seat 10 guests. Credit card reservations may be made by phone, 972-267-LIFE, or online at www.prolifedallas.org. Spanish translation headsets will be available. Call the CPLC office, 972-267-LIFE, to reserve. New this year: Silent Auction and Exhibits in Atrium I beginning at 5:30 p.m. "Say 'Yes' to Life!" and join us for this year's celebration!